Congratulations to Green Moon for winning the 2012 Melbourne Cup! The Melbourne Cup Carnival is one of the biggest sponsored events in the world, so The Engravers Register thought we would see how sponsors of the Engravers Register benefit from their association with us, and how we benefit from their continued support. All of our sponsors are leading businesses and suppliers in the engraving industry, and are committed to supporting the industry and the businesses working ardently within it. The Engravers Register has two levels of sponsorship – Premium and Supporting. Some of our sponsors, for example WoodMarvels.com and Trotec Laser, are quite active in promoting their association with The Engravers Register by supplying blogs, or providing special offers to our registered businesses. Another one of our sponsor businesses that feverishly work in the background is Doris Agencies, who are focussed on driving traffic and enquiry via The Engravers Register website for our businesses. There are many benefits our sponsors enjoy (apart from the “feel good of supporting the industry”), and we are always looking for more sponsors for The Engravers Register. Please contact us for more details on package benefits (Premium and Supporting) and to further discuss opportunities. Alternatively if you know of any sponsors who could benefit of supporting the industry, please let us know! History of the Melbourne Cup Trophy – things you didn’t know! Today is the race that stops the nation, and one of the most recognisable trophy’s in the world. Today as we all puts our bets on and hope for the winner, the Engravers Register thought we would take a look at the history of the Melbourne Cup Trophy, courtesy of the official Melbourne Cup website “The Loving Cup Trophy“. Good luck with your bets – we all hope you back a winner! PLUS good luck to all the trainers, jockeys and owners – who wouldn’t want to hold that Cup aloft! The Emirates Melbourne Cup Trophy is a stunning 18 carat gold trophy. Noted for its “Loving Cup” design, the trophy is one of the most identifiable sporting trophies in the world. It is a national icon embedded in Australia’s cultural fabric and strikes emotions with all ages around the country. The Cup was manufactured by Drummonds Jewellers and handmade by James W. Steeth and Son. Maurice Steeth took over manufacturing the Cup from his father yet following Maurice’s premature death, it was left to his able assistant ‘Lucky’ Rocca to continue the tradition. In 1980, the making of the Cup was then entrusted to Hardy Brothers Jewellers and the same processes commenced in 1919 are still adopted today. Mr Stuart Bishop, Chief Executive of Hardy Brothers Jewellers is entrusted with this responsibility today. It is made of 34 pieces of gold metal hand beaten over 200 hours. The evolution of the Cup from the inception of the Melbourne Cup race in 1861 is quite fascinating and reflective of a people determined to develop a symbol reflective of a developing nation. 1861 : Archer – The trophy took the form of a hand beaten gold watch. 1865 : Toryboy – First year the trophy was awarded. Manufactured in England, the trophy was an elaborate silver bowl on a stand. 1867 : Tim Whiffler – Silver trophy from England shows ‘Alexander Taming the Horse’, the engraved name of the winning horse and the figure of a winged female. 1876 : Briseis – The first gold cup trophy manufactured in Victoria. An Etruscan shape with two handles. One side depicted a picture of a horserace with the grandstand and hill of Flemington in the background. The opposite side, inscribed on a crimson enamelled garter, the words “Melbourne Cup, 1876” and the name of the winning horse. 1877 – 1886 : No trophy presented. 1887 : Dunlop – A golden horseshoe mounted on a plush stand and valued at 100 sovereigns. 1888 : Mentor – Known as the “Centenary Cup”, three horses appeared on a silver-plated base. 1890 : Carbine – This magnificent trophy reflected the opulence of the time. A silver ewer, salver and tazzas are representative of this magnificent trophy. The trophy was purchased by the VRC in 2000 and is on permanent display at the National Sports Museum at the MCG, Melbourne. 1891 : Malvolio – A trophy measuring two feet in length and fifteen inches high of a draped figure of Victory, standing on a pedestal, holding out an olive wreath to a jockey upon his horse. 1893 : Tarcoola – Multi-piece trophy of silver tankard, punch bowl and beakers. 1894 – 1898 : Trophies were not presented as the economic depression engulfed the nation. 1900 : A tea and coffee service was presented. 1908 : Three feet long plaque of an embossed silver galloping horse, that some people thought resembled a greyhound. A much ridiculed design for trophy. 1909 – 1911 : Two-handled silver cups. 1914 : This was the last year the Melbourne Cup Trophy was made in England. It had a long base with a horse on each end facing out and a chalice cup in the centre. 1915 : A large rose bowl that was made in Australia. 1916 : The first gold cup is presented. 1918 : Two-handled gold cup trophy. 1919 : James Steeth’s three-handled “Loving Cup” first introduced. 1973 : Smaller Melbourne Cup miniatures are presented to the winning trainer and jockey. 2001 : The Cup moves from 9ct to 18ct gold. Valued at $80,000. A 2/3 height miniature of the Cup is presented to the trainer and jockey. 2005 : The breeder of the Cup winner will be presented with a Melbourne Cup half-sized Cup. 2008 : The value of the Cup trophy is increased to $125,000 reflecting the rising price of gold. Trainer, jockey, strapper and breeder trophies are also increased bringing total value of all trophies to $150,000. visit our Flemington Heritage Centre. The above content has been reproduced from the official Melbourne Cup website “The Loving Cup Trophy“. All content that has been reproduced is owned by the Victorian Racing Club Limited. Today The Engravers Register thought we should share one of our Premium Sponsors, Evright.com, blogs about the work they have been doing. 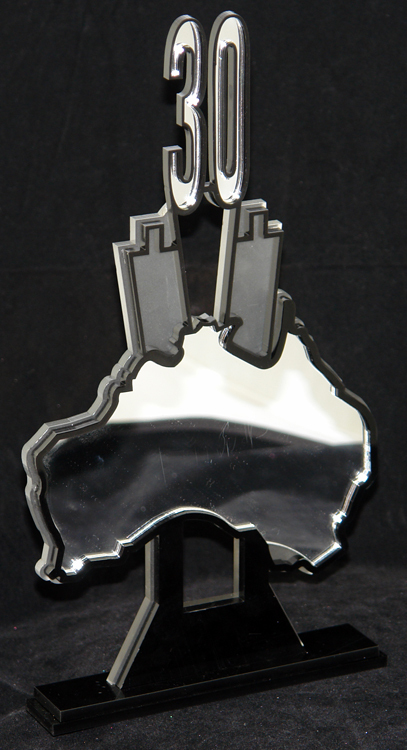 Evright.com are one of the leading trophy, medal and personalised giftware businesses Australia-wide and focussed on personalised engraving work for leading businesses. We thought these knives were pretty awesome, along with the jigs they made for them and due to the fact that the job went 20x faster, we are all ears here…. over to you all for your future business ideas!! Evright.com got the opportunity to laser engrave, using our new Trotec Speedy 300 Flexx machine, a whole whack of cheese knives from famous designer Georg Jensen. Normally a job like this would require a lot of labor but thanks to the Flexx’s ability to laser engrave stainless steel without having to resort to using Cermark, the project went 20x faster! As referenced on EngraversRegister.com ‘s Blog, jig creation and use is a must for jobs like this. It saves so much time in set-up and allows batches of work to be done at once with exact precision. As you can see, placing the knives in the proper location is child’s play. The laser then does its work, engraving the knives as if they were nothing but cheese themselves! Once done, the knives are taken out of the Trotec Speedy 300 Flexx. There is no heat so they can be handled immediately nor are any fumes generated as only the surface of the knife’s molecular structure is changed, no material is actually removed in the process! Now that the knives are engraved, they are put into their packaging with another round ready to be engraved. Once they are all done, they are packaged and sent off to their new home. Get your own laser engraver! Evright.com has some amazing customers because we use amazing laser engravers powered by the passion of our employees! 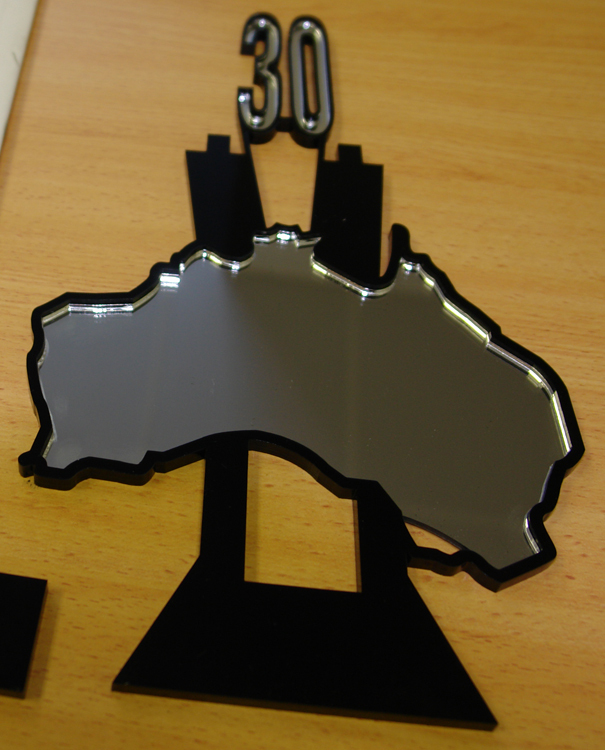 If you are in the market for a laser, check-out the full product range of laser cutters and engravers at Trotec Laser Australia. Engravers Register – 500 businesses and counting! We now have over 500 registered engraving businesses – both nationally and internationally. Our businesses range from trophies, corporate awards, medals, right through to signage and industrial engraving businesses. Looking forward to the next 500 coming on board! In today’s blog, The Engravers Register sponsor WoodMarvels.com will provide the first of a series of tips and advice on how best to promote your business, and how they have maximised their promotional investment for their unique product offering. Dependent on your products and business, targeted marketing to specific audiences you know are relevant and much more likely to buy is normally better than communicating your product to the masses. Happy marketing! Traditional advertising refers to those mediums that were traditionally used to promote and advertise businesses and include TV, press (newspaper and magazine), direct mail, radio and signage. While these channels have rapidly changed with the advent of digital, online and social media, these mass communication channels are great to reach larger audiences. Radio is a great and normally more cost effective way to advertise your business compared to the other channels, but with the growing popularity of mp3 players and iPods, and people able to forward through commercials, ad repetition and special promotions are normally best to achieve traction. The great thing about radio is it’s relatively large audience and can be targeted to your demographic or audience (for example if you’re a sports trophy store you could advertise during local sports final broadcasts to target your local sports teams). It can also get your message out quickly. Although most listeners can quickly change the dial, they will usually just listen to your ad and quickly forget it… that’s why repetition is key. One ingenious business booked just one radio spot booked every weekday just before the 8am news (which everyone listened to while they were in the car). Repetition of the message saw the business enquiry and brand awareness increase amazingly. Like radio, the relevance of newspapers /inserts and magazines is rapidly diminishing in the online age, while their prices to advertise increase. However, they are still great for mass communication and getting your business word out and can usually be tied with an online promotion. Magazine advertising can be a lot more targeted to the audiences you are wanting to attract, and as such you can receive a lot more “bang for your buck”. For example, a business that specialises in personalised and engraved wedding gifts chould advertise in bridal magazines where they will have a captive market. In further blogs we will focus on other mediums that increase enquiry to your business. Engraving has been an integral part of our lives and even our mode of communication. Hand-engraving using crude tools on stone for our cave-age predecessors, the Egyptians and engraving hieroglyphics, right through to the middle ages and today’s modern engraving machines are all an essential part of our lives. In todays blog, the team at Engravers Register thought we would provide some interesting facts on engraving, courtesy of Wikipedia. The first evidence for humans engraving patterns are hatched banding upon ostrich eggshells used as water containers found in South Africa in the Diepkloof Rock Shelter and dated to the Middle Stone Age around 60,000 BP. Engraving on bone and ivory was an important technique for the Art of the Upper Paleolithic, and larger engraved petroglyphs on rocks are found from many prehistoric periods and cultures around the world. In antiquity, the only engraving on metal that could be carried out is the shallow grooves found in some jewellery after the beginning of the 1st Millennium B.C. The majority of so-called engraved designs on ancient gold rings or other items were produced by chasing or sometimes a combination of lost-wax casting and chasing. Engraved gem is a term for any carved or engraved semi-precious stone; this was an important small-scale art form in the ancient world, and remained popular until the 19th century. Glass engraving, usually using a wheel, to cut decorative scenes or figures into glass vessels appears as early as the first century AD, continuing into the fourth century at urban centers such as Cologne and Rome, and appears to have ceased sometime in the fifth century. European Middle Age goldsmiths used engraving to decorate and inscribe metalwork. It is thought they began to print impressions of their designs to record them. From this grew the engraving of copper printing plates to produce artistic images on paper, known as old master prints in Germany in the 1430s. Italy soon followed. Many early engravers came from a goldsmithing background. The first and greatest period of the engraving was from about 1470 to 1530, with such masters as Martin Schongauer, Albrecht Dürer, and Lucas van Leiden. Hopefully you will be able to use one or two of these facts in your dinner conversations when you mention you work in the engraving industry! We will continue with more interesting facts on the history of engraving in future blogs! We just found this great story on our sponsor Trotec Laser Australia’s website, so thought we would share for a lazy Sunday read. 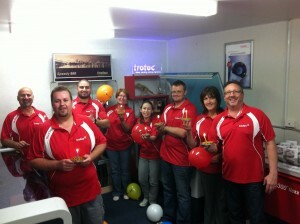 In early October 2012 (the 1st to be exact) the staff at Trotec Laser Australia joined their colleagues around the world to celebrate parent company Trodat’s 100th anniversary. The Trotec team celebrated in typical Austrian fashion, dining on Linzer torte and schnitzel. 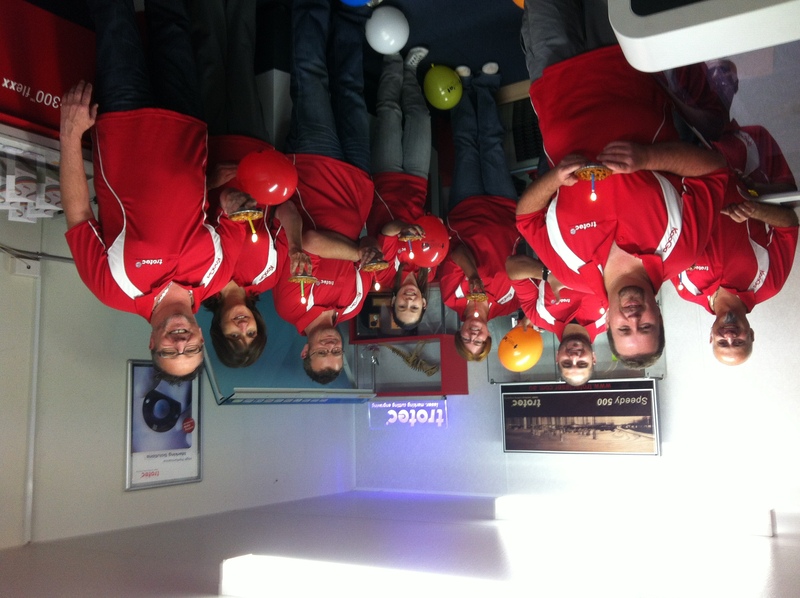 Trotec Laser Australia said on their website while it was a great opportunity to recognise past achievements, the celebration was also an opportunity to look ahead – as they continue to innovate and look for even more ways to ‘make their customers more profitable’. The website also stated “the team remains committed to their customer’s success – as they look toward the ‘next 100 years'”. 100 years is a very long time in anyone’s language and testament to the quality and longevity of Trotec’s machines. The team here at Engravers Register wishes Trotec and Trodat congratulations on their 100th anniversary, and best wishes for continued success for the coming 100 years! 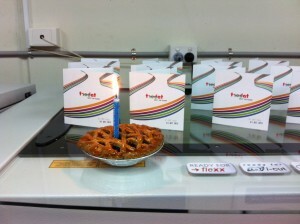 100th birthday celebratory Linzer torte Even the Trotec Laser machines got in the mood!!! Today’s blog is courtesy of one of our sponsors – Jon Canton at WoodMarvels.com. WoodMarvels.com laser cuts and constructs some amazing 3D creations. Although rapid prototyping is often coined to mean prototyping with a 3D printer, having a laser cutter ready and able with lots of scrap material can be just as fast (depending on the model). Before you put laser to wood or acrylic, firstly you need to put pen to paper. This is the most productive aspect of prototyping. Here, you could spend a few minutes to a few hours working on a design until you make something that you like and you know you can replicate. In this step, you build the model you have designed on paper, in the software program (we are dealing with CNC after all). This can take a few minutes or weeks depending on the complexity of the model you sketched. This is also a cheap method of seeing how your design will fit together… in this step all you waste is electrons which are a dime a dozen. Alright, you went from sketch to electrons… next step is a physical prototype. This can be the most enjoyable or awful experience you have… everything you THOUGHT would look good or work well together might be right or dead wrong. This is when you learn the most as unlike the previous two steps, you are bound by the laws of physics found in the Universe you inhabit! Cutting a model is usually straight forward but that’s only half the battle… remember jigsaw puzzles as a kid? You have to somehow put the jumble of pieces in front of you into a working model! Odds are that you’ll have more than one piece and with each piece you add to your model, another source of error is introduced… for interlocking parts, the complexity and error rate seems to grow exponentially! However, the end result is definitely worth it. It’s like the old song “ebony and ivory… living together in perfect harmony”… well, not exactly perfect harmony, but rotary engraving and laser engraving can be perfect companions, as today’s blog from our website sponsor Trotec Australia tells us! Rotary or mechanical engraving is a ‘physical contact’ process where a rotating tool engraves material such as plastic or metals. Laser engraving is a ‘contactless’ process offering fast results with uniquely valuable characteristics. The lasers do not need to follow a tool path set up and as a result engraving times are considerably faster. 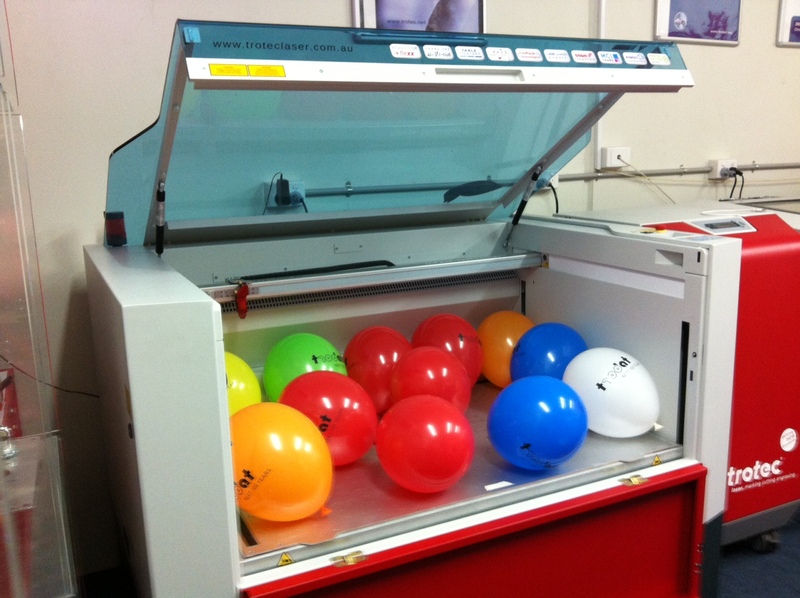 Engraving businesses can benefit from the combination of both processes and use each machines strengths to ensure the perfect result for every job (and happy and return customers a result)! Laser engravers are available in two classes – CO2 lasers and Fibre lasers. Laser engravers are effective on the same materials as rotary engravers, however the Fibre laser offers superior results on metals without the aid of pre-treatment. The Trotec Speedy range offers a unique ‘Flexx’ function which combines both a CO2 and fibre laser source in the one machine – enabling the machine to process the widest possible range of materials seamlessly. The choice between rotary engraving and laser engraving comes down to speed, the desired look and the permanency of the mark. Laser engraving is faster than rotary engraving, and each produces a different appearance. Rotary engravers offer perfect results for 3D signage such as raised lettering and deep engraving or milling, however laser engravers are able to mark the surfaces of metals without affecting the integrity of the material (the best process for marking stainless steel items used in the mining, medical and hospitality industries). Why not combine the strengths of both processes in your engraving businesses! Sounds good to us here at The Engravers Register! If you want to find out how the perfect companionship of a rotary engraving and laser engraving partnership can benefit your business, get in touch with our website sponsors, Trotec Laser on 1800 674 499. Today’s blog is courtesy of The Engravers Register website sponsor WoodMarvels.com! WoodMarvels.com is unique in many ways within the CNC industry but by far the most noticed is its heavy use of 3D visualization in order to produce and showcase its designs. Most shops use Corel or to a lesser extent, Adobe Illustrator, to produce line drawings that end up being cut with their CNC based machinery. For all the advantages put towards designing using this method along with trial and error, it can’t replace the power that comes to seeing a design come to place within a 3D environment. 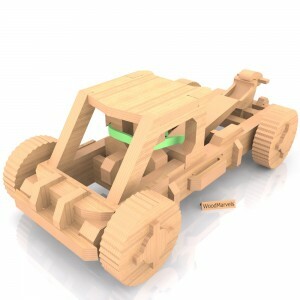 All the designs on WoodMarvels.com regardless of how simple they may appear, have their origins in the virtual 3D space. The advantages are numerous including the ability to waste electrons over of stockpiles of wood in order to test a design, accurate designing process that can be exported to numerous formats (3D printers, laser cutters…. ) and relative easy viewing of the model as it’s being designed. For all the benefits that 3D visualization gives to WoodMarvels.com, there are also a few costs. The biggest is its computing requirements – just about any computer can run Corel but not every computer has the horsepower to run Autodesk’s 3D Studio Max (which is what WoodMarvels.com uses). Another major stumbling block to 3D visualization is the very steep learning curve across a number of areas such as 3D modeling, animation, texturing, lighting (and the list goes on). What WoodMarvels.com uses in both software and hardware to produce a model is equivalent to using a sledge hammer to kill an ant. If you can get over these two major requirements, given enough time though… this overkill can quickly pay for itself in allowing others to quickly understand a model you make. Take technical support, since 2008, WoodMarvels.com has never had even ONE request for technical support regarding how to put a model together as unlike text, a 3D animation has no language barriers. It can also re-render higher resolution images as technology advances, when the site first stated, it rendered the 3D assembly animations at 320 x 240 pixels but now renders at 1920 x 1080 HD… a massive difference in quality and resolution! There are many ways to produce a design, use what you are comfortable with and don’t be afraid to think way outside industry standards.